November 1 – December 24, 2018 • Open Sundays 12-4! Known for her extraordinary hand-crafted felted wool sculptures, Elsa Jo Ellison is among 100 artists whose handcrafted work will be sold at this year’s Holiday Gallery Shop. 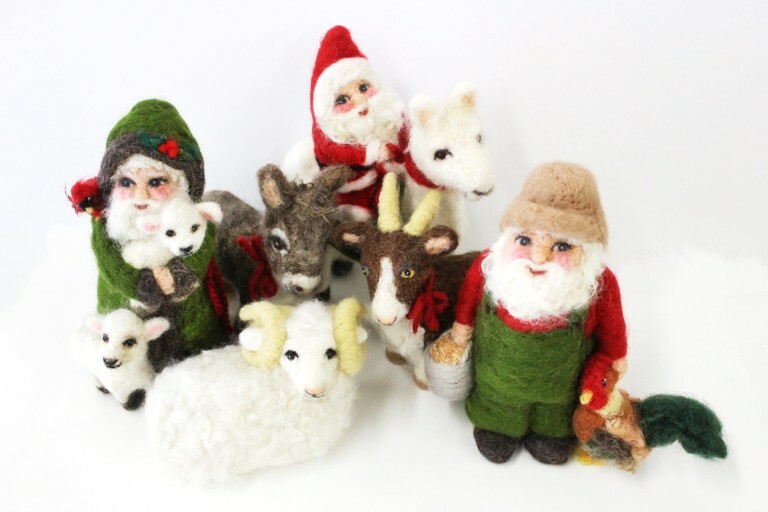 For more than 20 years, Elsa Jo, a native of Wanamingo, Minnesota, has been sculpting wool from the sheep at the Ellison Sheep Farm, and she has created an endless variety of original figures and creatures, each with its own personality, detailed eyes, and unique expression. The Ellison Sheep Farm in Zumbrota, Minnesota, raises Shetland, Icelandic, and Gotland sheep and the entire family helps with sheep shearing every spring. Her favorite fleeces are set aside, labeled with each sheep’s name, then washed, carded, and dyed by hand in small batches. The Shop carries exquisite handmade fiber art, from luscious wearables of every hue to home décor and gifts, along with books, professional art supplies and tools, fiber craft kits, and other unique finds. In addition, the Shop carries a plethora of eco-friendly merchandise, including upcycled fashions, sustainable materials, and naturally dyed items. For the holidays, Textile Center triples the Shop’s regular footprint, expanding to fill the Joan Mondale Gallery with even more fabulous one-of-a-kind fiber art, just in time for gift giving. Many of the artists are new to the Textile Center, selling their work for the first time at this special pop-up holiday shop. Patrons are also invited to take a selfie with our new life-sized, yarn-bombed Santa! Each Saturday from 11 am to 4 pm, the Holiday Gallery Shop hosts artists in person with trunk shows, demonstrations of their technique, hands-on “try it” opportunities, prize drawings, and more! Textile Center is located in the Prospect Park neighborhood of Minneapolis –centrally located and easily accessed via car or public transportation. Saturday, Nov. 3: Felt Fest: Wet Felting • Buy beautiful wearables and home décor that result from agitating wool fibers with warm soapy water. Saturday, Nov. 10: Yarn Fest • A celebration of all things yarn, from spinning it to weaving with it. Saturday, Nov. 17: Felt Fest: Needle Felting • Adorn you walls and home with art created by felting wool fibers with special felting needle tools, and give it a try yourself. Saturday, Dec. 1: Members Fest • Special discount for our 1000+ members! Saturday, Dec. 15: Textile Machine Fest • See a knitting machine, Cricut cutter machine, and more in action. 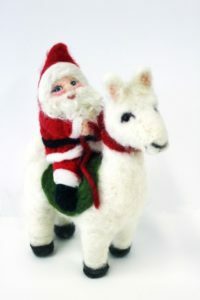 Buy exquisite, hand-made fiber gifts created by 100+ artists!